Holiday market week is here! After working all semester, my students’ products are bagged, tagged, and ready for purchase. 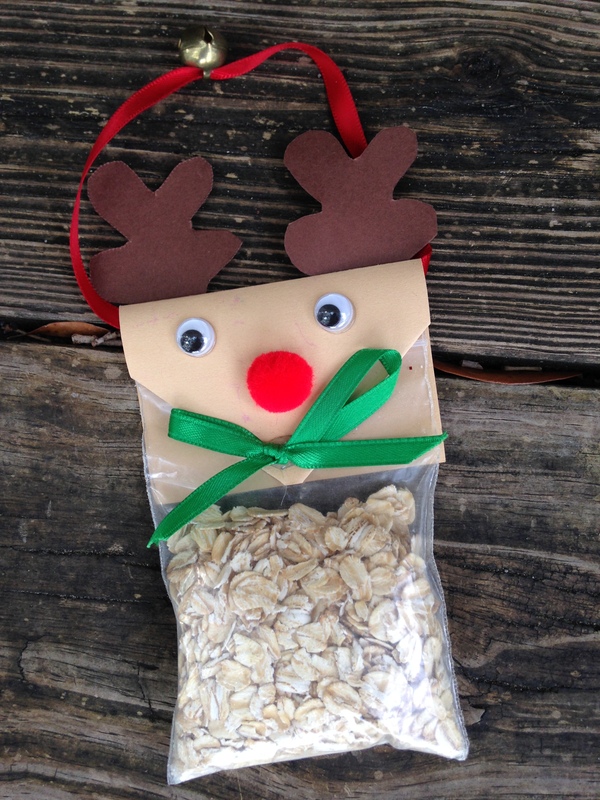 The first product we assembled back in September were these reindeer food ornaments to hang on your Christmas tree (we also made these BIRDSEED ORNAMENTS and several MASON JAR MIXES). On Christmas Eve, you open the bag and sprinkle the reindeer food on your lawn to attract Santa’s reindeer. I originally received a bag of reindeer food from a grandparent in my son’s 3-year old nursery school class. I kept that original bag all these years and duplicated (modified) the pattern over the years. 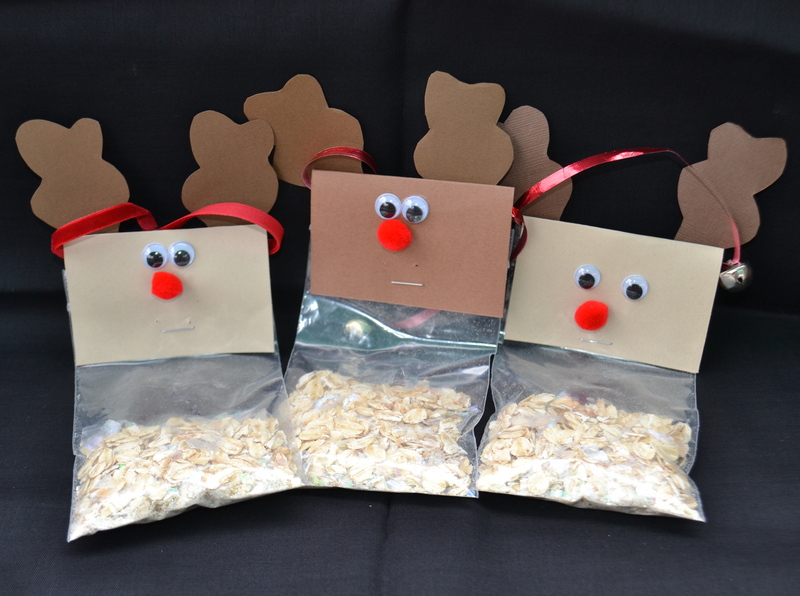 The original reindeer food is a little fancier than the version my fourth graders made this year. Mass production with a 10-year old work crew forced us to simplify a few of the steps. Mix oatmeal and glitter in a bowl. You will need 1/4 cup to 1/2 cup of oatmeal mix per bag, so mix the amount you need and add the amount of glitter sparkle you like! Scoop sparkly oatmeal into a bead bag and seal the bag closed making sure the ziploc is secure. Don’t overfill the bags. I like the bags to be about half full and not overly plump. Set aside. Make an antler template. I cut up a manila file folder to make my template. The antler is about 2 1/2″ tall and 1 1/2″ at the widest bumpy part. 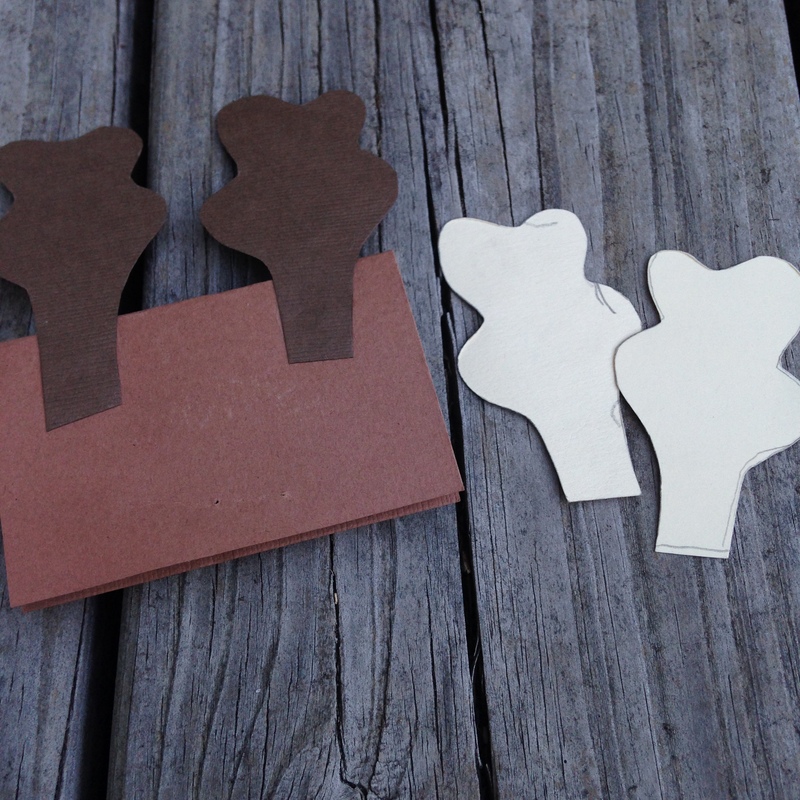 Using the template, trace the antler pattern on the dark brown paper and cut as many antler pairs as you need. Fold the light brown 3″ x 4″ paper in half, so the paper is 2″ x 3″. Glue two antlers on the back and let dry. Watch that the antlers do not slide while the glue is wet. You may need to hold the antlers in place for a minute until they stick in position. 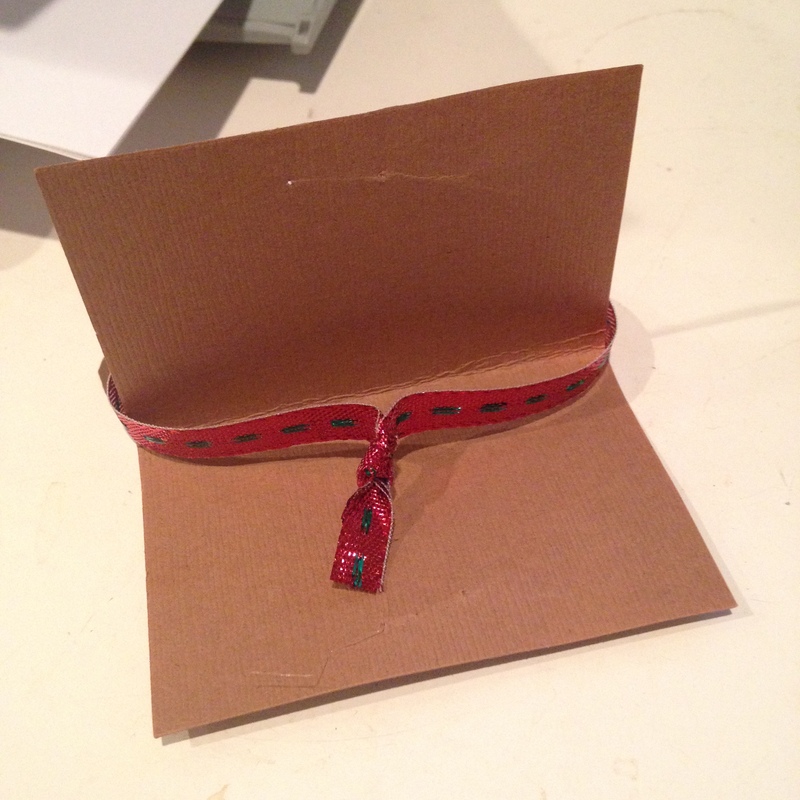 Thread one jingle bell onto a piece of ribbon. Silver jingle bells were easier to thread than gold; they had a bigger “loop” on the bottom in the brand that I purchased from Michael’s Crafts. Move the jingle bell to the middle of the ribbon piece. Match the ends of the ribbon and tie a knot close to the ends. After the antlers dry, wrap the loop of ribbon around the folded piece of paper, so the knot of the ribbon sits up against the fold, and the jingle bell is above the paper near the antlers (like a handle for hanging). Slide the oatmeal bag into the folded paper and line up the top of the bag with the crease at the top of the paper fold. You may have to adjust the ribbon strip a little, so everything sits neatly. Staple the bag in place in the center of the paper where the mouth would be. Glue eyes and nose onto the front of the paper and let dry. 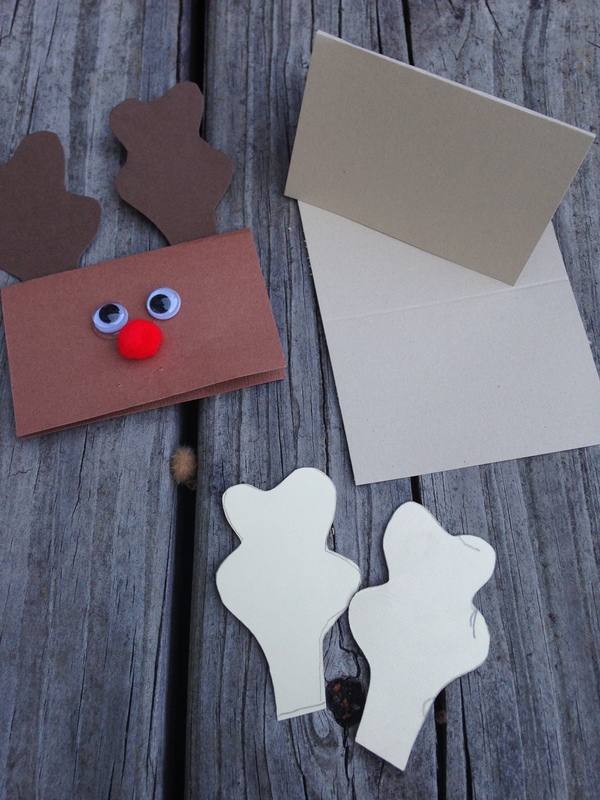 If you want to dress up your reindeer food a little, see the picture below with embellishments like the bow on the front (to hide the staple) and pointed face. This one is my original reindeer food bag that I have been using as my model all of these years– and not letting my children open and use it! 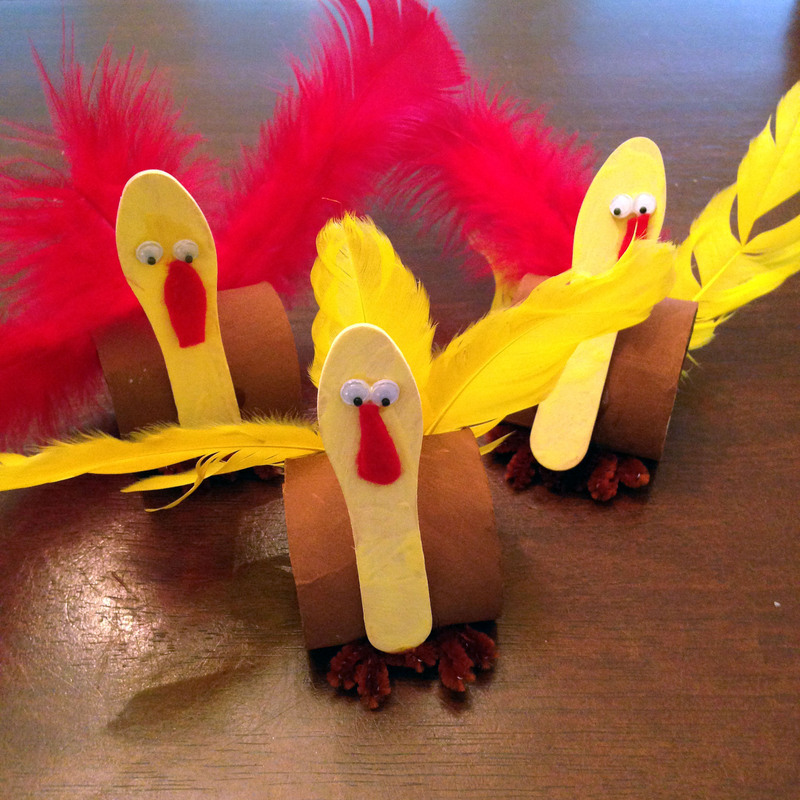 I pulled out the turkey toilet paper roll napkin rings my children made when they were in kindergarten. 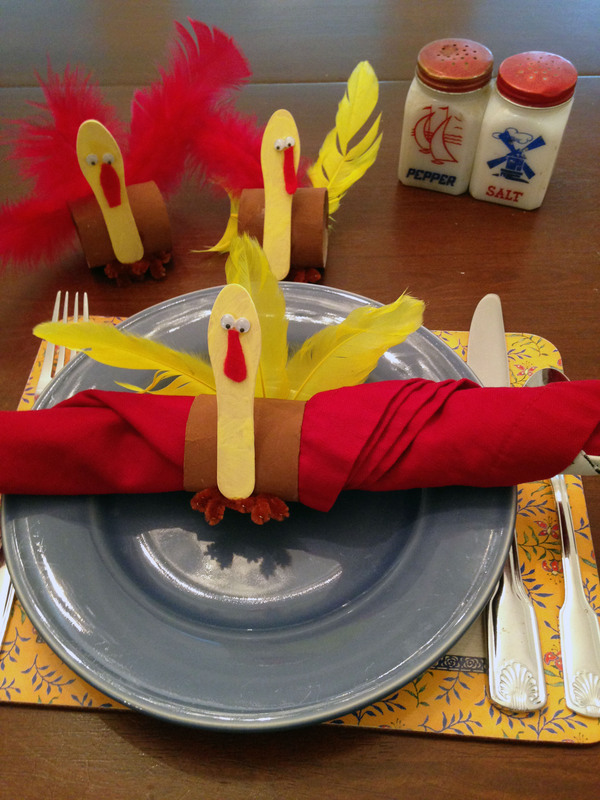 I like to use them for a few weeks around Thanksgiving– not just on Thanksgiving day. The year my son built his, we made sets for all of the grandparents and extended family and brought them with us to our family Thanksgiving meal. My in-laws still have their napkin rings. 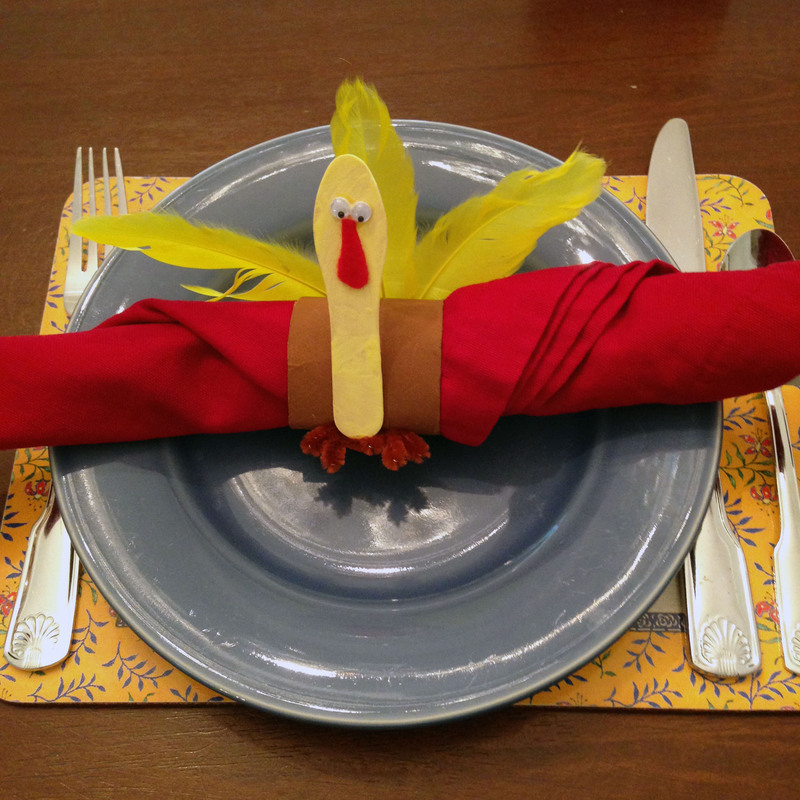 If you make the napkin ring at school, it’s a fun little craft students can take home to their family. 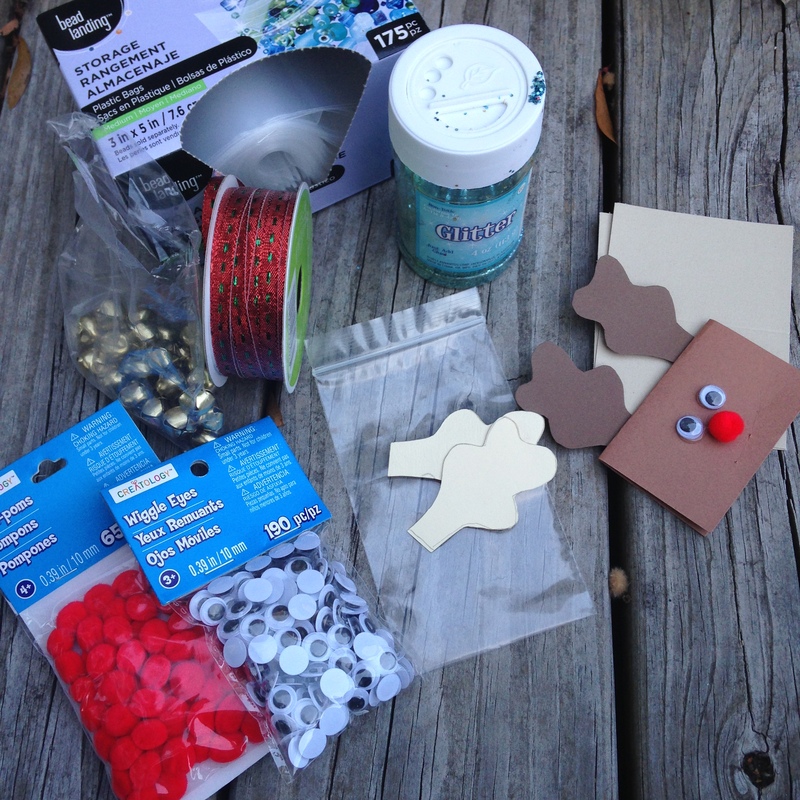 If you are building these with a whole class, you may want to pre-make certain steps, and you will need two days to let paint and glue dry– or do some work at the beginning of the day and finish construction towards the end of the day. toilet paper or paper towel rolls cut into 2 inch wide rings. Cut the red felt into a tear drop shape about 1-inch tall. After the paint dries, glue the red felt tear drop shaped piece onto the middle of the spoon end of the wooden stick. Glue two googly eyes above the read waddle. Let dry flat. 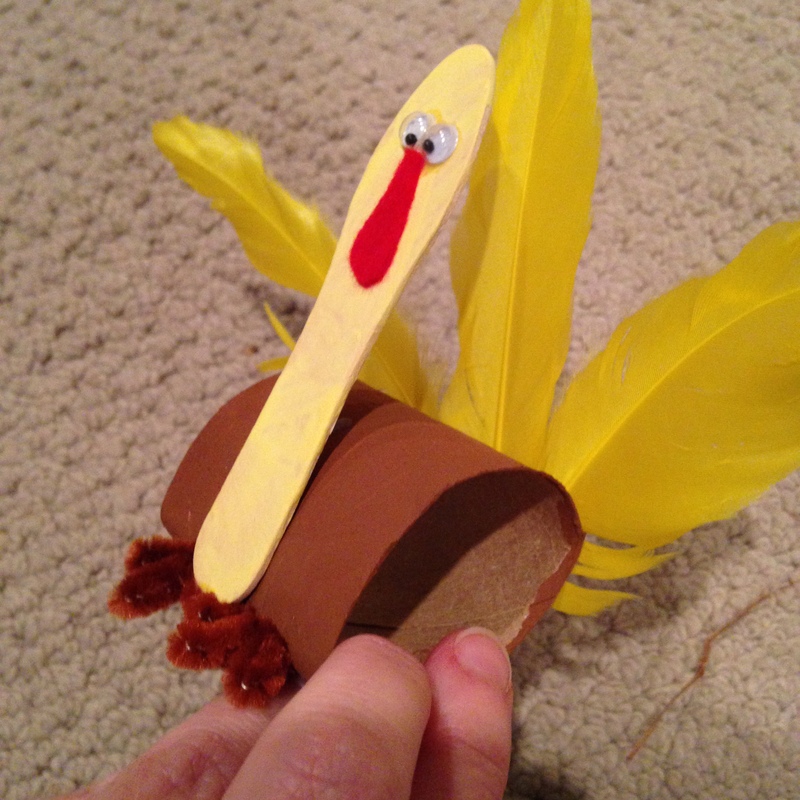 Glue the yellow wooden stick turkey face to the side of the painted toilet paper roll piece. You may need to hold the craft spoon in place for a few minutes, so the face does not slide to the side. ** Note: Hot glue might be a better option here since the Elmer’s glue takes longer to dry and hold. If you are adding the pipe cleaner feet, you will need an adult to poke two holes at the base of the wooden spoon. Thread the pipe cleaner through the two holes, so a loop runs around the inside of the toilet paper roll. Fold and bend each pipe cleaner end into feet shape with 3 toes. Cut any excess length of pipe cleaner off. 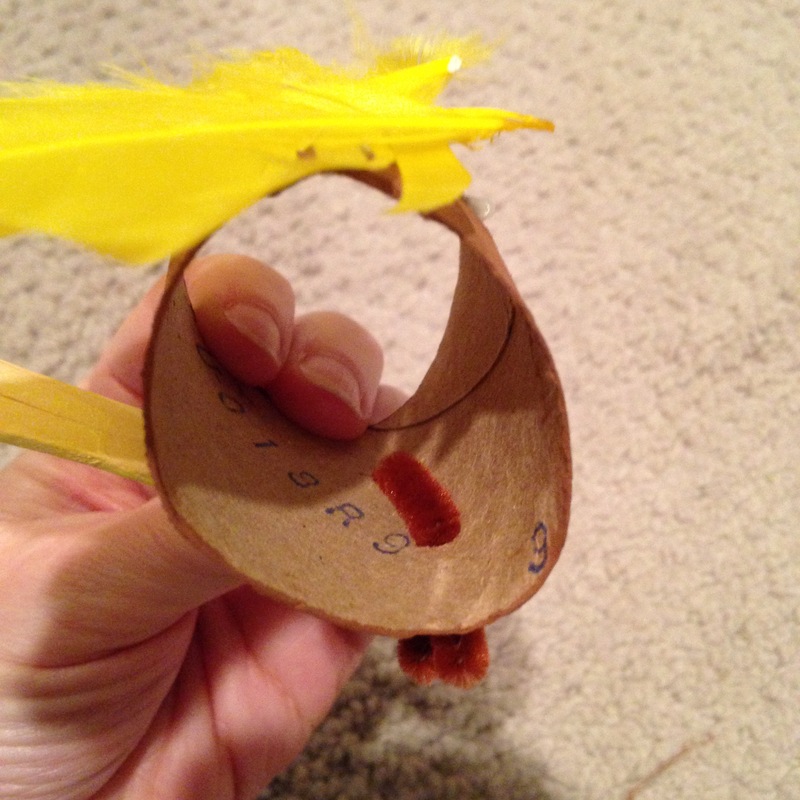 Glue 3 feathers onto the back of the toilet paper roll and arrange, so the feathers are fanned out. 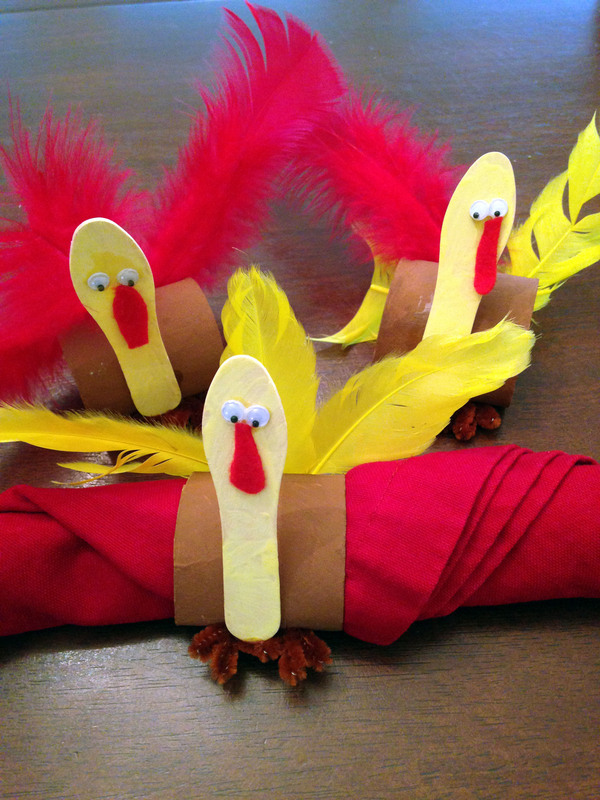 Roll a napkin and slid into the napkin ring and set at each place setting for your Thanksgiving feast!